Natasha is an author, digital strategist, and has worked with technology for more than two decades. She has founded numerous SaaS startups, written several books about technology, including Homo Digitalis that maps the science behind human digital behavior, she worked as a digital futurist and associated partner at the Copenhagen Institute for Futures Studies. Natasha has lived in New York where she supported startups scaling into the US market, and hosted the TV show “Tech and The City”, from Nasdaq in NYC. 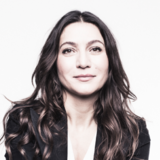 Natasha holds several nominations as one of the most influential women in Tech in Europe. Today Natasha works with corporate venture through digital innovation and growth.